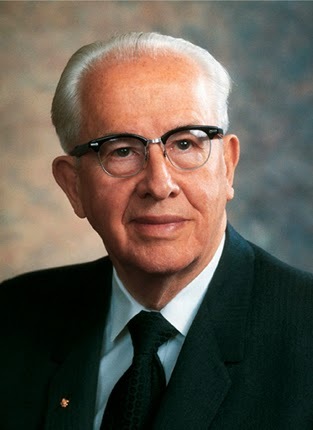 President Ezra Taft Benson (born August 4, 1899 - 117 years ago today; died 1994) was called to the Quorum of Twelve Apostles in 1943, and served as the 13th President of the Church from 1985 until his death in 1994 at age 94. "Opportunities to lose oneself for the good of others present themselves daily: the mother who serves her children's needs; the father who gives his time for their instruction; parents who give up worldly pleasure for quality home life; children who care for their aged parents; home teaching service; visiting teaching; time for compassionate service; giving comfort to those who need strength; serving with diligence in Church callings; community and public service in the interest of preserving our freedoms; financial donations for tithes, fast offerings, support of missionaries, welfare, building and temple projects. Truly, the day of sacrifice is not past. "One of Satan's greatest tools is pride: to cause a man or a woman to center so much attention on self that he or she becomes insensitive to their Creator or fellow beings. It's a cause for discontent, divorce, teenage rebellion, family indebtedness, and most other problems we face. "If you would find yourself, learn to deny yourself for the blessing of others. Forget yourself and find someone who needs your service, and you will discover the secret to the happy, fulfilled life." 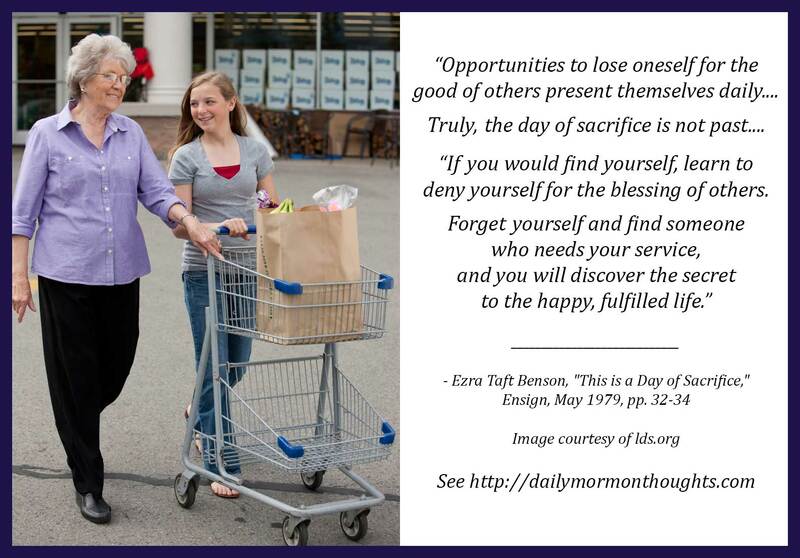 President Benson's reminder of the many ways we can serve and sacrifice in our basic, daily roles is good to ponder. We are all blessed as we serve, and blessed more as we sacrifice to serve. But Satan would teach us to focus more on our own selves, becoming insensitive to those around us. 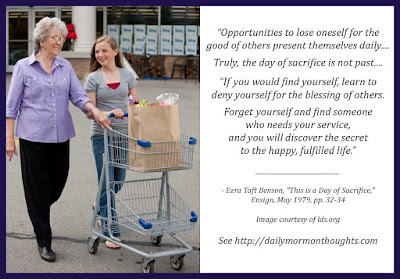 President Benson points out that many of our modern challenges are the result of that pride and selfishness. So the key to "finding yourself" and to a truly happy life lies in learning to deny self in order to bless others.